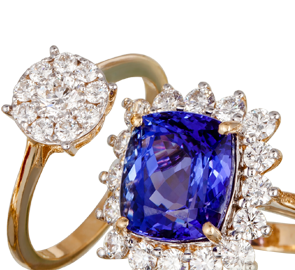 9K Yellow Gold Tanzanite (Ovl), Natural Cambodian Zircon Cluster Ring 5.250 Ct.
An engagement ring is like no other ring; it is a symbol of your commitment. It is as significant as the moment itself for it not only defines your style but also defines your relationship. To make sure you choose the right piece, TJC brings in an eclectic collection set in gold, platinum and silver that will suit your preference and budget. We handpick best of the gemstones from around the world and craft them into splendid rings for all you glamorous women in UK. Every woman has a dream ring that she either gets a chance to pick herself or be surprised with, whether you prefer vintage or modern or traditional, TJC has it all for you under the exclusive in-house brands Iliana and Rhapsody. You will also find some lavish pieces that are a combination of more than one style and will immediately appeal to your senses. Celebrate your love and relationship with the most exquisite pieces from TJC for these rings are donned forever and even passed down for the generations to come. A modern heart sometimes desires the most traditional of things, which is why Diamond has continued to be the favoured choice for majority of the women. For the traditionalist in you, we at TJC have put together an exotic assortment in variety of styles to choose from – eternity, solitaire, cluster, floral etc. Diamond engagement rings rings are an epitome of commitment, the unique a piece you pick, the more you become a reason for the awe of others. diamond rings designed in conjunction with other precious gemstones that add an element of elegance to your overall look, are garnering admirers by the moment in UK. As an eternal symbol of your love and commitment, you need something that can stand the test of time. Even though Platinum is beginning to gain popularity, Gold still steals the show as the most trusted metal to have this ‘Forever’ piece of yours set in. TJC has an impressive assemblage of diamond and gemstone engagement rings crafted with utmost precision in 9K, 14K and 18K White gold, Yellow gold and Rose gold. Modern or traditional, whatever your style is, a gold engagement ring is as timeless as the love you both share; mark this special occasion with a piece from TJC’s collection. Diamond set as a standard for engagement no longer holds, as gemstones are now rightfully claiming a position in the jewellery boxes of the commoners after being a noteworthy aspect of the rich ensemble of British Royalty for generations. A trend set by Lady Diana, Princess of Wales and carried on by Catherine, Duchess of Cambridge, Sapphire engagement rings are garnering some envious looks for the wearer. TJC has in store a magnificent array of Emerald, Ruby, and Tanzanite engagement rings that will not only speak volumes about your love but also your fashion sense. You are not just exchanging rings; you are exchanging expectations and promises. TJC makes sure yours lasts forever.